Under the Southern Stars – the Summer Festival is excited to announce this year’s return with a huge line up of the best of Australian rock. Off the back of last year’s inaugural success, the festival is expanding into 6 new coastal locations as it continues to deliver music lovers the ultimate outdoor live music festival in a quintessential Aussie summer setting. This year’s 2019 concert event will be headlined by Australia’s legendary ARIA Hall Of Fame inductees, Hoodoo Gurus. Also added to the bill will be our very own indie rockers Eskimo Joe, You Am I plus The Superjesus, British India, The Getaway Plan and Scott Darlow. For over three decades the Hoodoo Gurus have consistently been one of the most inventive, lyrically smart and goddamn exciting rock’n’roll bands Australia has ever produced. Along the way they’ve influenced an entire generation of bands including the likes of You Am I, The Living End, Dallas Crane, Grinspoon and many others. Hoodoo Gurus, by any measure, are one of Australia's greatest, best loved and most enduring rock bands. Iconic indie legends, Eskimo Joe, has become one of Australia’s biggest bands. They have successfully straddled mainstream commercial success while managing to keep their Alternative Music roots secure. With 5 studio albums under their belts and sales exceeding 750,000 in Australia alone, the band has seen 3 of those albums debut at No. 1 on the ARIA charts. Eskimo Joe have brought home 3 International Song writing Awards, 11 WAMi Awards and 8 ARIA Awards plus have seen 11 songs feature in Triple J’s Hottest 100. You Am I are without doubt, Australian rock royalty. More than two decades on from their first album release, You Am I have not only had one of the longest and most successful recording careers in Australia, but are also one of our most loved live bands. They have won a total of Ten ARIA Awards including Album of the Year, Best Group, and Best Independent Release. The Superjesus are one of Australia’s most successful and respected rock bands who remain a stable on Aussie rock radio. They have expertly managed to bridge the gap between their instantly recognisable late 90’s hits and their current melodic rock sound – bringing together new fans and those who’ve been loyal for 20 years. Over their career, they have collected 3 x ARIA Award and have release multi-platinum albums plus hit singles. Since British India, first appeared on the live scene, critical interest swept over the band and Triple J took them under their wings. They’ve conquered the stage, played to an array of sold out shows and music festivals galore. British India have released five albums, have nailed three ARIA Top 10 debuts, multiple ARIA & J Award nominations, have won an AIR Award and have had five entries into the triple J Hottest 100 over the course of their career. But wait there is more! For Queensland audiences only, stay tuned for an chart topping special guests to be announced on 2nd October – watch this space. 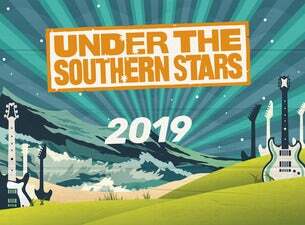 Under The Southern Stars will deliver a great day of rock n roll, in superb outdoor locations – it doesn’t get better than this!